View components are similar to partial views, but they're much more powerful. View components don't use model binding, and only depend on the data provided when calling into it. 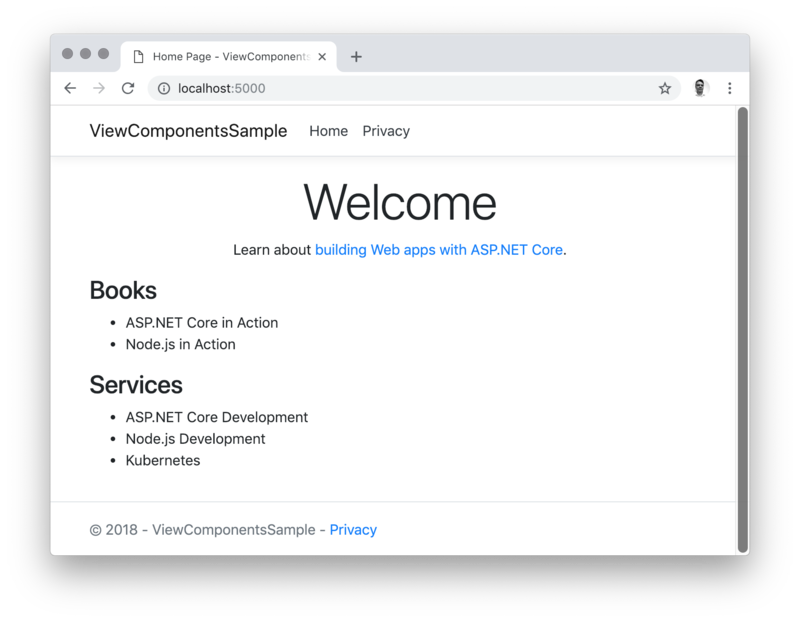 This article was written using ASP.NET Core MVC, but view components also work with Razor Pages. Yet, it was a bit of confusing when trying to use View components with Tag Helpers and passing fragments of the parent view model to the View Component by attributes. As you can see, there are two "sections" named "Books" and "Services" and both have child elements. The Tag Helper to invoke a view component uses the <vc></vc> element and it added by the addTagHelper directive. Also, Pascal-cased class and method parameters for Tag Helpers are translated into their lower kebab case - this will be important very soon. This component also uses the @addTagHelper directive and it defines a ViewModel of type PageSection which has been a fragment of the IndexViewModel from above. Besides rendering the Section title it also calls another View component and passes it's own SectionItems (kebab-casing again) to the child View component. The name (and of course the type) of the parameter(s) passed as Tag Helper attributes have to match the name and type of the Invoke method - and kebab casing is your friend again. You can nest View components at arbitrary levels, so I added another one to finally list the SectionItems. The sample can be found on GitHub.